When android released its 7th avatar, people were unsure about what the Nougat system would actually change when it came to smart phone technology. Even the latest, version 7.1.2 released in April of 2017 was not strikingly impressive or remarkable in any way unless you consider the several changes to your web browsing experience. Though the Nougat system is only available to about 10% of the smart phone market worldwide, we all know how fast mobile phone companies upgrade their technology. The new touch screen browsing experience is faster and handier than the older versions, and is far more accurate than the voice activated Siri or Google AI which most users found to be more novelty than functional! While it is still unsure how successful Nougat will be as an OS, it has definitely changed the format by using Google on a phone which is much more interactive and responsive. The format for website changes frequently as designers imbibe new features to the browsing experience; but the use of chat bots have become very popular in the year 2017. A number of recently launched interactive websites are using a very smart conversation format to modify the browsing experience. 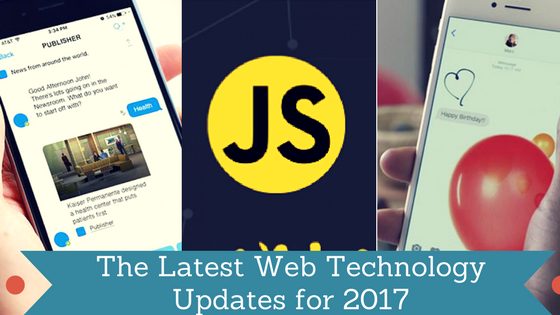 Content developers and graphic designers have also had to change their game to adapt to this new conversational approach which has become a prominent feature of this year’s latest web technology update! AI Chat windows have not only become far more intelligent, but webpage’s entire user interaction seems to be more about personal communication than images and interactive tabs. Some of the prominent uses for such smart Chat Bots have been implemented on shopping portals to make a more user friendly browsing experience when looking through online catalogues. Searching on a shopping portal has been modified to a conversational format, where you can actually interact with the AI for more accurate product searches. Added with Motion UI, which recognizes individual browsing patterns of users; this new conversational AI system seems to have a bright future for public web portals.